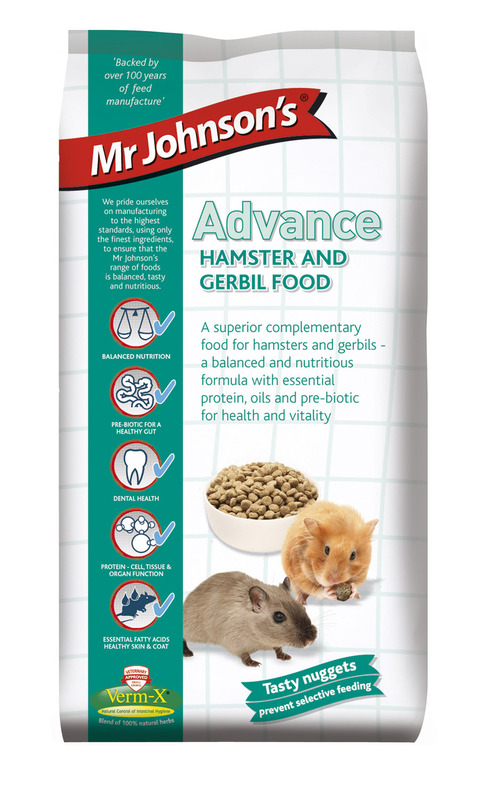 Mr. Johnson's Advance Hamster & Gerbil is a nutritious, complementary food for hamsters and gerbils. It is a mono-component food which prevents selective feeding. This meal should be fed alongside fresh vegetables daily and a small piece of cooked meat twice a week. Fruit, dried mealworms and hard boiled egg can also be fed alongside as a treat. Wheat, Wheatfeed, Soya Bean Meal, Oats, Sunflower Seed Meal, Linseed, Calcium Carbonate, Vegetable Oil & Fat, Mono Calcium phosphate,Bio Moss ®, Sodium Chloride, Verm-X ® Herb Blend. Vit A: (E672) 10,000 iu/kg; Vit D3:(E671) 1,000 iu/kg; Vit E: 50 iu/kg. Iron: (E1) 161mg/kg, Manganese : (E5) 89mg/kg, Zinc Oxide : (E6) 69mg/kg, Copper : (E4) 20 mg/kg, Iodine: (E2) 0.8mg/kg, Selenium : (E8) 0.44mg/kg. This advice is a guide only. Advance hamster & gerbil food is a complementary food and should be fed with suitable fresh fruit and vegetables. Hamster’s and gerbil’s are omnivores so should also be fed a small portion of cooked lean meat, like chicken a couple of times a week. As a treat they will also enjoy a mealworm - dried mealworms are ideal. Clean fresh water should be available at all times. There are currently no questions for Mr. Johnson's Advance Hamster & Gerbil Food - be the first to ask one!